Grand Velas Riviera Maya’s Sen Lin was awarded the American Automobile Association’s (AAA) Four Diamond Award, the fourth restaurant at the resort to be so honored. With 22 Diamonds by AAA, Grand Velas Riviera Maya has set new standards in the All-Inclusive World – its food, creativity and presentation comparable to top restaurants in world capitals. In addition to Sen Lin, the AAA Five Diamond resort offers guests five gourmet offerings including the AAA Five Diamond Cocina de Autor and Frida and Piaf, rated Four Diamonds. 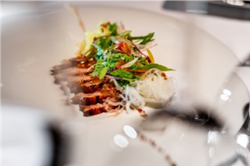 Sen Lin is founded on the culinary traditions of northeast and southwest Asia including China, Japan, Korea, Vietnam, Malaysia, Cambodia and Thailand. At the helm of the restaurant is Chef Wayu “Light” Wattanakamin whose 14 years of culinary-industry experience and exploration of international cuisine keep traditional food and flavors of Asia in every dish. Sen Lin offers authentic Asian decor indoor and outdoor views from the terrace of the Yucatan’s lush jungle setting. Signature dishes include bamboo-steamed buns filled with pork; pork wontons with pickled vegetables, Siam Pad Thai, and rack of lamb with Sriracha and grapes. Each year AAA reviews more than 31,000 restaurants. Only 2.1 percent make the AAA Four Diamond list. AAA Diamond Ratings for restaurants represent a combination of the overall food, service, décor and ambiance offered by the establishment. The descriptive ratings are assigned exclusively to establishments that meet and uphold AAA’s rigorous approval standards. A Four Diamond restaurant provides distinctive fine dining, creatively prepared, and skillfully served, amid upscale ambiance. Gourmet meals and premium beverages are included in the resort’s nightly rates. Rates start at $434 USD per person per night based on double occupancy and also include luxury suite accommodations, 24-hour in-suite service, fitness center, taxes, gratuity and more. For reservations or additional information, call 1-888-407-4869, or visit http://www.rivieramaya.grandvelas.com. The AAA Five Diamond Grand Velas Riviera Maya is an ultra-luxury all-inclusive resort set on 206 acres of pristine jungle and mangroves and with the finest white sand beach in the Riviera Maya. Guests can choose accommoda-tions among oceanfront, ocean view and a Zen-like tropical setting, embraced by the flora and fauna of the Yucatan Peninsula’s jungle. All 539 designer-like suites are exceptionally spacious, more than 1,100 square feet each, all with balconies, and some with private plunge pools. All feature fully stocked mini bars, L’Occitane amenities, arti-sanal mezcal, and Nespresso coffee machines. Bathrooms deserve special mention with walk in glass shower, deep soaking Jacuzzi tubs and marble interior. Eight restaurants, including five gourmet offerings, present a tour through Mexico, Europe and Asia. Cocina de Autor, at the hands of world renowned celebrity chefs Bruno Oteiza, Mikel Alonso and Xavier Pérez Stone, holds the AAA Five Diamond Award, the first all-inclusive restaurant in the world to win this prestigious distinction. Se Spa is the region's largest spa sanctuary at more than 90,000 square feet, known for its authentic Mexican treatments, offerings from around world and signature seven-step water journey. Other features include 24-hour Personal Concierge; 24/7 in-suite service; three swimming pools; two fitness centers; wa-ter sports; innovative Kids’ Clubs and Teens’ Club; baby concierge; Karaoke Bar; Koi Bar; Piano Bar, and business center. The resort offers more than 91,000 square feet of meeting space and outdoor areas for events inclusive of a 31,000-square-foot Convention Center, able to accommodate up to 2,700 guests. The resort has won numerous awards from Travel + Leisure, Conde Nast Traveler, USA Today and several other magazines and major companies worldwide, including Virtuoso’s Best Spa and TripAdvisor’s Hall of Fame. A member of the Virtuoso Hotels & Re-sorts Program, Grand Velas Riviera Maya was built and is operated by Eduardo Vela Ruiz, founder and president of Velas Resorts, with brother Juan Vela, vice president of Velas Resorts, by his side. For reservations or additional information, call 1-888-407-4869, or visit http://www.rivieramaya.grandvelas.com.